The Warden is a master of the wilderness east of Grant’s Town – some would call him a ranger or just a guardian who keeps the humanoids and monstrosities of the wilds from infringing too much on the commerce and lives of more civilized folk. The Warden’s hold is roughly two days on horseback east of Grant’s Town; dug into the side of an unnamed estuary of the Holden River. Not much of the structure is visible initially to those traveling past – the front shows a two-tiered stony structure that has been build into the hillside with some defensive arrow slits by the entrance on one side and above it on the other. From the back a small stone structure is embedded in a curve in the hill with a single door in the middle of the wall. Because it is the only structure within a few days ride, the Warden designed the hold with the entrance area specifically big enough that people and animals can seek cover within during bad weather even when the Warden is not around – although he keeps all three doors under very secure locks as they lead both into the defensive structures and into the hold proper. 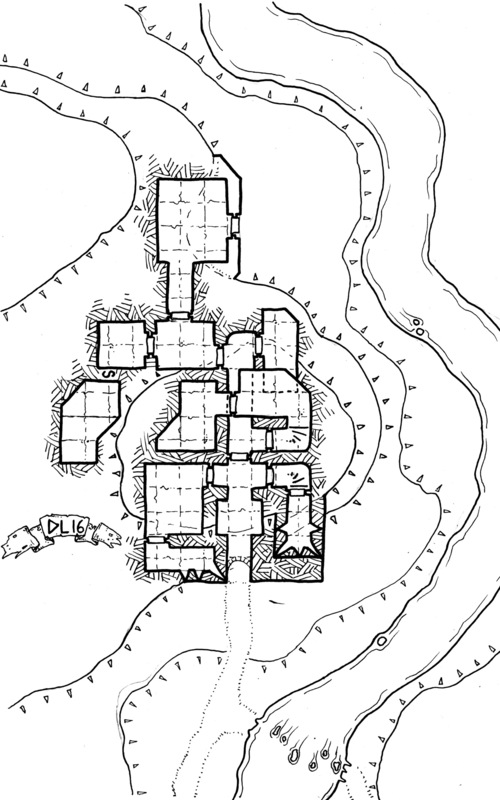 The hold itself is a multi-chambered affair over two levels with a secret room hidden off to the side where the Warden keeps odd treasures and critical supplies. The room is accessed by a secret door that slides into the floor initially exposing a small niche above the secret room that usually has a few hundred gold pieces and some local maps within it. However, a secret catch inside the niche can be held and the secret door lowered even lower into the floor, exposing the 30″ tall entrance into the secret chamber beyond. Although this map is lacking in the tiered farmland I would usually include in-game, it is definitely based on some structures I have built while playing Minecraft over the years. Hi Dyson, the open cave as a travelers’ shelter is a great touch for a Ranger to include as part of his lair. No doubt he leaves stacked firewood and some hay or bracken. If he is really nice, some kind of preserved food. If I were to use this location, I’d add a murder hole and some arrow slits from the first upper room to the hall below. I think the upper story actually has some small windows and is relatively pleasant as living quarters.